Taking your motorcycle out on the road requires a few essential pieces of gear. While helmets and goggles might be the first thing you think of, having a good GPS system is becoming more and more important for drivers, both on-road and off-road. GPS technology has been around for a long time but never before has it incorporated the range of features which it benefits from today. Having road-maps and quick routes is today seen as standard, and some GPS systems have also gone out of their way to include weather updates, traffic information and even fuel prices in their modern technology. Because GPS technology is constantly evolving, we updated our article to reflect the most current devices available on the market right now. With this update we replaced older models with newer ones and ensured we have a variety of options on our list to suit any need and budget. Some models utilize Bluetooth technology, while others use Wi-Fi. Some include multi-media features such as music, radio, video and gaming programs, while others take pride in providing the bare essentials in a clear and concise manner. When it comes to choosing a good GPS for your motorcycle, you’ll have to consider your own needs against the specific features of each model. We’ve put this review together to save you the time on research. We’ve broken down all the important features that you’ll need to know when it comes to choosing your GPS navigation system. The Garmin Nuvi is a top of the line GPS unit with a range of useful features that make it a great pick for any motorcyclist. With voice activation and commands, Bluetooth and Android compatibility, and lifetime traffic updates, the Nuvi is well-equipped to take the strain of navigation while driving. Also comes with a speed monitor, street and building names and many more useful features. You will never need to take your hands off the grips with Garmin’s voice-activated navigation. Combined with Bluetooth and smartphone connectivity, this means you could navigate freely without having to touch the screen. This model comes with the option of lifetime traffic updates without any ongoing subscription charges. Traffic information appears on-screen unobtrusively and gives you time estimations as well as preferred route recommendations. The Nuvi 2597 commands a price reflective of its manufacturer’s reputation. Garmin are market leaders, and this GPS system is loaded with enough features to warrant paying a just a little bit extra for it. The 57LM from Garmin is another handy piece of kit that does far more than merely give directions. This model comes preloaded with millions of entries which fill in the streets around you; from information on restaurants and gyms to warnings about upcoming school crossings. Also comes with a dual-screen display and detailed lane demarcation, which makes staying in the right lane something you won’t have to worry about. 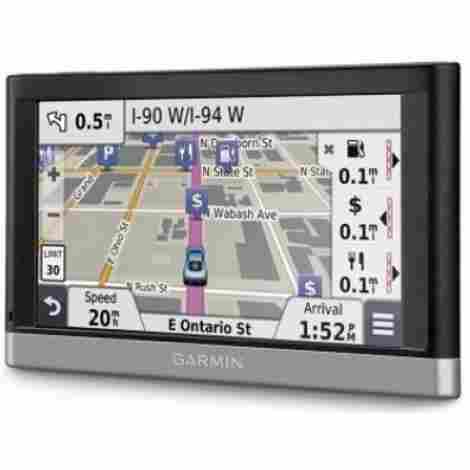 The Garmin navigation voice has been designed to offer more personable navigation instructions and will make mention of nearby landmarks and buildings to make things easier for you while driving. The 57LM comes with a detailed ‘Junction View’ feature which zooms into an upcoming junction and marks clearly which lane you’re supposed to be in. A major plus, as many GPS systems fail to implement this feature. There are models both much more and much less expensive than the 57LM. Overall, it fulfills more than you could ask of a navigation system, and its mid-range price-tag is comprehensively justified. This GPS system from Koolertron is of the ‘all terrain’ variety and can handle all but the most extreme conditions. That’s no empty claim, as the 912S can be submerged in water without breaking, and is equipped to handle rain or snowfall while you’re out on the road. A sleek 4.3-inch display and a huge capacity for data storage make the Koolertron an attractive navigation option. The internal memory is capable of holding 4GB of data on its own, while a Micro SD slot can take another 16GB. The 800Mhz processor and 256MB of RAM make this model a very useful little computational travel companion. The USB port makes for quick and easy transfer of data, without having to rely solely on manufacturer updates. The audio out port is a useful addition and fills the gap left by a lack of Bluetooth connectivity. The Koolertron All Terrain model is a sturdy piece of gear that’s ready for all weather. Its list of useful and unique features gives it a price comparable with Garmin models, but it still presents great value for money at its upper mid-range price. This Garmin model comes in a miniature size and can be worn like a watch if desired. This is a durable, no-frills model which sacrifices large displays and fancy graphics for simplicity and wearability. A military-style model which will be more suited to off-road drivers, this GPS system presents an intriguing and unique option for off-road navigation, and it can function in deep ravines and canyons, or under heavy tree-cover. This wearable navigation system also comes with a range of useful features like sunset/sunrise times, hunting/fishing information, an electronic compass and a barometric altimeter. The use of standard AAA batteries makes sourcing power less of a problem. The Foretrex 401 comes with an adjustable, tough Velcro strap which allows the GPS unit to be worn on the wrist. This is useful for those who can’t use handlebar mounts, or for extreme off-road drivers who need the extra security. The Foretrex 401 GPS system occupies an upper mid-range price comparable with other Garmin models on this list. Its small size and sleek, no-frills display doesn't reduce its value, as it adds many new features in return. Best suited to off-road drivers. This 7-inch, super-slim display from AWESAFE comes with built-in Hi-Fi speakers with an FM transmitter. The voice-prompt system makes for a hands-free driving experience, while full 3-D images paint the roads in high detail and make navigation clear and simple. This model also comes with lifetime map updates and is pre-installed with maps of North and South America. 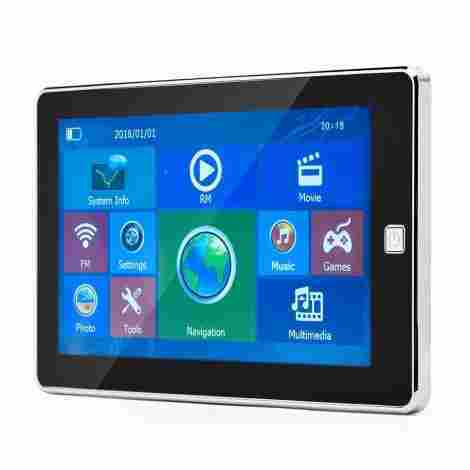 The sensitive touchscreen display is in true HD, with a resolution of 800x400, and comes ready to play and display pictures, videos, and audio files. The large display combined with highly detailed 3D roadmaps make this great for easy viewing. With built-in speakers and an FM radio transmitter, this model can also function as a useful audio player. Its music player capabilities give it a two-in-one functionality that could reduce the number of devices you need to carry with you. 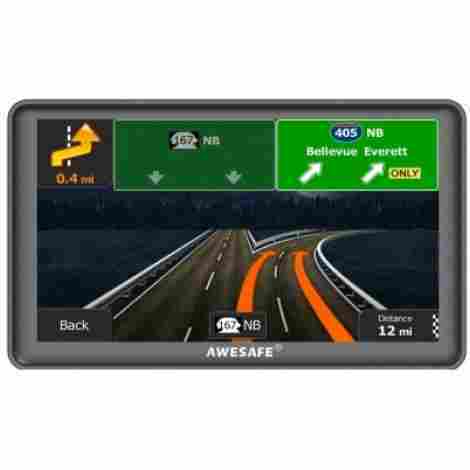 This GPS system from AWESAFE comes in at a significantly lower price than many on this list, despite having a larger display. A lack of real battery life and no Bluetooth connectivity probably account for the lower price. The AWESAFE 8GB still presents good value. 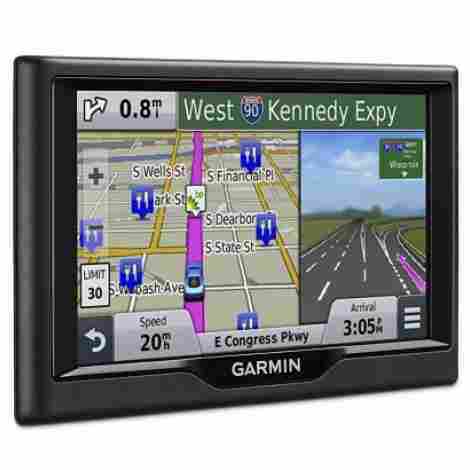 The High Sound GPS is a large screen navigation system that doubles up as a multi-media device. It has the ability to play videos and run games on its 7-inch 800x480 resolution screen. Its navigation tools include multi-language personable voice directions and notifications for upcoming curves, school zones, red lights and speed cameras. Lifetime map updates are included for free. The 7-inch display is a couple of inches bigger than other named brands. The native screen resolution of 800x480 is one of the highest you’ll find and allows this model to compete in a tough market. This GPA system comes with 3 months of buyer protection in the form of a money-back guarantee. Meanwhile, the warranty that ships as standard with the High Sound GPS lasts a lifetime. This model comes in at a much lower price than brand named competitors, while still supplying comparable functionality. The large, high res screen makes it a good choice for those who value clarity on the road. 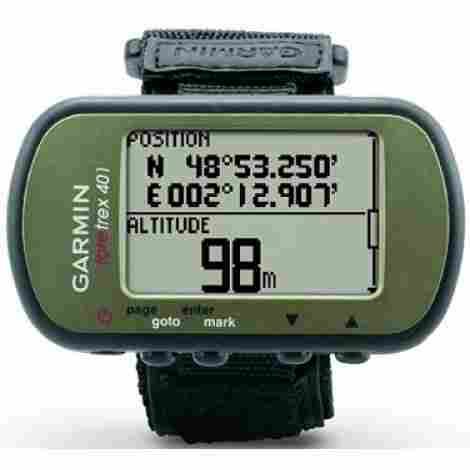 This premium model from Garmin uses high accuracy topographic maps to completely represent your current terrain. This sleek, nimble device is small enough to fit in your pocket, while the 2.6-inch screen is large enough to convey the essential information while driving, should you decide to mount it to your handlebars. The 64ST also uses Bluetooth and contains a 3-axis compass with a barometric altimeter. Any purchase of the 64ST comes with a free one-year subscription to Birdseye Satellite Imagery. This highly detailed top-down satellite display reproduces your immediate surroundings with laser accuracy and includes local and natural landmarks. The 64ST uses a quad-helix antenna and the GLONASS receiver is a high-sensitivity tool for staying informed of your surroundings. This model operates anywhere, regardless of terrain. This will benefit off-roaders particularly. The Garmin 64ST is a premium model and its price is reflective of this. It comes with a range of useful features too numerous to list and is essential for off-roaders. This GPS system justifies its price easily. 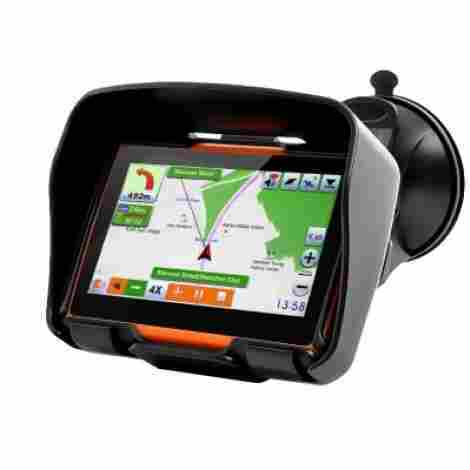 The Voyager is a GPS device that has been designed specifically for off-road tracks. It is water-proof in light-medium rain and can be fitted to monitor your engine temperature. The Voyager comes with a handlebar mount included as standard. The MicroSD slot is also water-proof and accommodates on-trail file sharing among fellow riders. Also includes information on ambient temperature, speed, altitude, and engine performance. You can programme the Trail Tech Voyager to remember your current route. It will then save the route for future use. This makes it a great tool for mapping out remote areas like fields and woodlands. The Voyager avoids large screens with flashy LCD displays and instead delivers the essentials in a display that will settle nicely into your handlebars without sticking out or getting in the way. A great tool for off-roaders. The Voyager represents the upper price-range in the moto-GPS market, but its range of motorcycle-specific features makes it a good long-term investment. It is one of the few on this list that are specifically designed for use by off-road motorcyclists. The Intelliroute is a smart piece of GPS tech which keeps track of a multitude of useful on-road statistics. This navigation tool also updates you on weather information, fuel prices, traffic flow and much more. The display contains multiple weather-maps, including heat displays and wind-readings. The device can connect to any nearby Wi-Fi spots and has a network of public information to make finding local services a breeze. The Intelliroute uses Wi-Fi connectivity to update the driver on a range of useful data-points. A connected device will benefit from weather updates, traffic news, fuel prices and more, all without any additional subscription fees or charges. The Rand McNally Intelliroute is encased in a thick polymer case with grooves for shock absorption. The screen is stepped-in beyond the case to add extra protection. An extremely durable piece of tech built with safety in mind. The Intelliroute uses a lot of unique features which set it apart from the crowd. Some features such as weather forecasts and fuel economy info will be essential for many drivers. A higher end price is justified here by the sheer functionality of the model. The eXplorist from Magellan is a precise off-road trail navigator with a full database of geographical information. The eXplorist is hailed as an all-terrain navigations system and it ships with over 115,000 authorized navigable off-highway routes. The 7-inch display screen is also shock-proof, dust-proof and even water-resistant. Magellan’s unique BackTrack technology makes it easy to find your way back home by remembering your routes. The BackTrack feature from Magellan allows you to explore the unknown, safe in the knowledge that you can find your way back home. By remembering your route from the start, all it takes is a click of a button to lead you back home. The TRX7 comes fully loaded with over 115,000 trails, with around 25,000 being added every year. This model also features over 6 million points of interest and has features allowing for social media updates and achievement earning. The Magellan eXplorist TRX7 is one of the priciest on this list, but it carries a reputation for reliability and has a wide range of features to back up its high-end price. It also comes with a Ram mount and offers good value for those who can afford it. As you can see, GPS units for motorcyclists come in a wide range of styles, and serve a variety of different functions. Some are designed as multi-media tools with gaming and video options, while others take a more spartan approach and offer up just the essential information. Most of the products listed on this list are designed with safety in mind and offer the motorcycle enthusiast some nifty solutions to on and off-road navigation. Whether you opt for voice activation, touch-screen options, or Bluetooth functionality, it will all depend on your preferred choice of attire: gloves, helmets etc. Every item on this list will easily provide the basics of GPS powered road and trail navigation. All of them have 2D or 3D graphical displays, with a variety of sizes to cater to your particular set-up, and they all come with the potential for limitless, lifetime map updates. All of them can be handle-bar mounted using ram clamps, while some come with the clamps included as standard. Be sure to check what mounts you’ll need when making your purchase. All in all, a good GPS navigation system is an essential piece of road-kit for motorcyclists. You should never have to second guess your safety while riding a motorcycle. Riding can be scary enough with the amount of drivers on the road that aren’t exactly up to date on etiquette around bikes. Your attention needs to be on the road at all times- point blank. We understand that looking away from the road poses a serious concern for people who ride bikes. We selected products first and foremost based on their ability to be seen without looking away from the road for extended periods.. This is actually why these displays are better than cell phones. Many people rely on their cellphones for directions while they are driving. This is, unfortunately, not a good idea for motorcycles. The screens are too small to be seen easily, and are a serious safety risk. Most of the products featured mount right in front of you, just like a cellphone would. The main difference is these motorcycle GPS devices have large screens that clearly display the information you need at a quick glance. Some of the displays are a little on the smaller side, but that comes down to preference and the style of motorcycle you ride. Sports bikes will likely need a smaller display, while cruisers can handle a larger screen. The make and model definitely matters! Regardless, all of them offer the security of knowing they will be safe to use no matter where you are, or where you are going. It is not fun at all to be stuck in the rain on a motorcycle. The raindrops feel like bullets, and the wind chill really freezes you right to the bone. The last thing you want to worry about is your GPS failing you right when you need it most! Low visibility is a huge problem, so it helps to be prepared for turns way ahead of time. If you are away from home it’s even worse for you to lose your way while stuck out in a storm. We tried to pick devices that are waterproof, or at least water resistant, because of this. Whether or not you really need a device that can withstand water somewhat depends on where you live. You might be able to get away with a less expensive model if the area you live in generally doesn’t experience much rain. This can include states like Arizona or Nevada which are mostly covered in arid desert. However, if you like to go on roadtrips with your bike you may actually still want this feature! We really suggest that you take into consideration the likelihood of going out of state. Washington and Oregon aren’t far away from Nevada, for example, and they are both states that get some pretty serious rainfall! So definitely keep in mind that it won’t stay dry outside for long, especially during those long stretches out of state. In the end the choice is totally yours, although we do recommend splurging for a unit that has adequate waterproofing. Imagine yourself flying down the highway: the sun is warm on your face, and there’s a beautiful breeze that smells like clean air and the summertime. You know what completes this picture? Your favorite tunes blaring out of your bike’s speakers. There is nothing like music to set the tone for your day. This is especially true if there is a road trip involved, but it can also add some much needed unwinding during your commute. Wouldn’t it be nice if your GPS included the ability to provide you with your favorite internet radio stations? It’s no secret that most people just don’t listen to the radio anymore. Generally, you turn it on and flick through the channels for a little bit here and there, but when is there actually music even playing? Not enough of the time! There are so many internet radios that provide constant access to your favorite songs. We chose some of these motorcycle GPS devices specifically because they allow you to stream music during your ride. You’ll never have to sit through a boring commercial break, or tune out a song that you don’t like, ever again. There are way more features than the ones mentioned, too! There are quite a few devices that offer features like gas prices, and allow you to load up directions to a gas station with just the press of a button. That’s pretty handy! Nobody wants to be stuck out on a back road with no idea how long it is until the next gas station. Being stranded on a bike is definitely a worst case scenario. We could list more, but we think you get the idea! We mentioned earlier in this article that safety is our number one concern. We know how much your safety while riding means, and we really take that seriously. Another criteria we used while looking through these devices was having hands free capabilities. This means that you can give commands to your GPS without having to touch the screen at all. Whenever you can keep your hands on the handlebars, and your eyes on the road, it’s a win-win. Hands-free means so much more than safety, however. It means convenience as well! There is definitely a sense of relaxation that comes with knowing you don’t have to play with your device every time you want to change the settings, or start up a different application. Being able to just tell your GPS what you need, and getting an instant result, is satisfying beyond what we can describe. In fact, you really just have to try it and see for yourself. Good thing there’s a handy list of motorcycle GPS devices right above this that have that feature! Another big concern these days is compatibility with your phone. This can allow you to do all sorts of tasks that would otherwise be impossible. You could load up music, for example, right from your cell phone. You can also take calls! This might seem impossible on a motorcycle, but with bluetooth technology anything is possible. You can hook a bluetooth onto your ear under your helmet, and easily take a call when you need to. We don’t encourage you to do this often, since you need concentration for the drive. It is sure great in a pinch, though! Taking phone calls isn’t the only reason you want your phone to be compatible with your GPS. Loading up directions, for example, and updating your device has never been so easy. Not all phones will be compatible with all products, however. Keep in mind that you will have to check the device for specific compatibility with your phone model. Older versions may have a harder time hooking up, for example, and some devices only work with the Android OS. Just some considerations to keep in mind while you’re looking for your perfect GPS device! The last piece of criteria we used was the features that the map itself comes with. We covered some of these in the media section, but there’s so much more to it than that. Some of these maps come loaded with a plethora of features, most of which are incredibly useful when you’re out cruising in unfamiliar territory. They are surprisingly still very helpful even in your hometown, though! One of the biggest features we looked for in the larger models was the style of map. We wanted maps that allowed you to really see what’s coming up so you can plan ahead. Extra features we also looked for included traffic updates, speed limit indicator, highway exit alerts, and even a few more. Not all of these models will come with these extra features, After all, we know that some of you like to keep it pretty simple, and that’s what fits best for some! We also wanted you to have the ability to choose a model that leaves so little for you to stress about. When you put your GPS on your motorcycle, you should be able to leave your worry behind. Q: How many features do I really need? This is pretty much up to the buyer! In all reality we suggest getting as many features as your budget allows. The safety that some of them provide is worth it. Knowing about gas stations in the area, being able to call people, and having emergency response just a button away are all great features to have! Q: Why are motorcycle GPS devices so expensive? We understand that some of these products are pretty pricey. This is because of how much they have to offer, however. Motorcycle GPS units are in pretty high demand, and people are totally willing to shell out some cash for an electronic that’s worth the price tag. GPS devices are definitely one of those items. Q: Are they safe to use while riding my motorcycle? Most units come with safety features that make it as safe as it can get. There is always a risk while using any device while driving. Motorcycle GPS devices do their best to pack in as much as they can to keep you worry free. If you are particularly worried about safety then we suggest a unit that has a large display, and a very clear map. Q: Where should I purchase my motorcycle GPS? All of the GPS units on this list have a handy link you can go to in order to make your purchase. These links are provided to you so these products can be available right at your fingertips! Amazon is a great place to buy from, as well, because of the convenience that it offers. You don’t even have to leave your house, and if you have prime you could have it as soon as tomorrow! No hassle, just the way we all like it. Q: What if I run into trouble while installing it? It’s never a bad idea to reach out to the seller if you have any snags in setting up your GPS unit. Sometimes technical difficulties come up, especially with technology. Your motorcycle GPS will come with instructions to mount. Most of the instructions will be pretty straightforward and easy to follow. If not, reaching out to the maker through e-mail or on Amazon is a pretty good way forward! Q: Are the extra features hard to figure out? This is a tricky question to answer! All technology can pose some problems if you aren’t familiar with it. Fortunately, most of the features you’ll find are easy to get the hang of. The GPS unit will make it fairly straightforward for you, and there are always guides online you can look at for extra assistance. Most people find that they are pretty good at figuring it out without the added help, however!